I’ll never forget the time I was on holiday on the Almafi coast for my birthday in 2009 and I received a call from a 001 phone number. I answered in my usual happy but professional tone and in return I heard; “this is abc law firm on behalf of company x and were investigating the misuse of corporate images that are currently on your Warren Knight website”. My energy very quickly shift from chilling by the pool, to getting up and walking away to a quite area inside the hotel. I had two choices. The first was to potentially go to court, and the second was to remove the image. As you can guess, I chose the latter. This was the first, and only time I’ve ever had an issue because of how careful I am around building my personal brand, and staying brand consistent. I have made the important choice of only using my own images, licensed images or free images. I wanted to write this article because this is a grey area when it comes to understanding the copyright rules on using images online. A picture is worth a thousand words, but only if you have followed the rules. I have done my research, and wanted to share with you the “ins and outs” of copyright rules on using images online. The laws around copyrighting were established to encourage creation, and not to allow someone the ability to deny access to using their work. There is a balance between the rights of a creator, and the public. Copyright is “a federal law that protects original works of authorship. A work of authorship includes literary, written, dramatic, artistic, musical and certain other types of works”. This law happens as soon as an original piece of work is created regardless of whether it has been taken with a professional camera, or through your smartphone. Copyright does not require any paperwork (unless you are looking at a trademark or patent). Only until enforcing said copyright would you need to register. In other words, the copyright logo is ironically, free for you to use. As the owner of a piece of content, you can do four things under your “exclusive rights”; reproduce the copyrighted work, display the copyrighted work publicly, prepare derivative works based on the copyrighted work, and distribute copies of the copyrighted work to the public by sale, rental or lending. Copyright does not apply to public domain works that include words, names, slogans or short phrases (do note that trademark is very different to copyright). 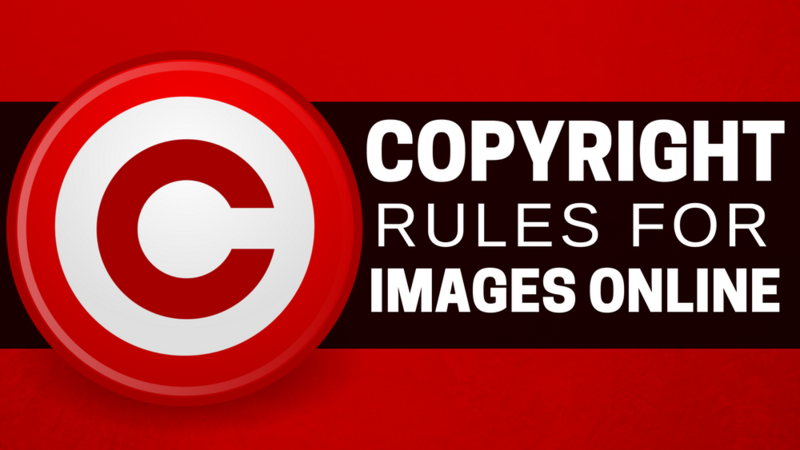 As a business marketing online, it’s important to know the copyright rules on using images online. Images are a huge part of connecting with your target audience online. If you are not a photographer, you may think that you don’t have much choice around images, but you do. Fair use is often mistaken for free use. Fair use is an exception to the legality around exclusive ownership rights for a copyrighted piece of work. What one deems as “fair use” may be different to the next. This rule in particular is in favor of the public, meaning that often copyright owners are left feeling angry and unjust. Fair use is “to allow for limited and reasonable uses as long as the use does not interfere with the owner’s’ rights or impede their right to do with the work as they wish”. With regards to this practice online, here as an example. As a retailer, you may stock products from a brand. This means that for you to advertise this product in a way that will connect with your audience, you will need visuals that are professional. As you are buying from a brand and selling their products, it is common to take their product images (by right-clicking and saving to your computer) from their website with the intent to use on your website. This is an example of what would be considered under the “fair use” law. Fair use has been put in place to give those without the resources to take their own photography the ability to use other peoples photo’s without permission to benefit the public. Imagine talking about the latest beauty product from your favourite company, and not being able to show the product you’re referring to. Now that you understand the “fair use” rule around copyright rules on using images online, what do you need to take into consideration if you are going to use a copyrighted image? 1. WHY are you using the image? Using a visual to make your latest blog look “nice” won’t cut it under the fair use rule. If you are using an image to comment on, teach your audience, or to provide research then you’ll be fine. 2. What have you done to make the image unique? If I am going to use a copyrighted image, I will make sure that is under the “transformative work” exception where what I have created no longer represents the original visual. 3. Are you using ALL of the image? You will have a better chance of finding fair use if you are linking to the original location if you are using all of an image without transforming it. You have a better case of fair use if you are only using some of the image. If you are looking for some FREE image tools that you can use, have a read of an article I posted earlier this week on Think Digital First here. I hope that the above will help you build your personal brand and stay consistent online. The images you use and how you use them will reflect perceptions online, so stay within the law and create visuals you can be proud of. The use of images can increase conversions by up to 150%! That COULD mean 150% more business and profits for you, as long as your images are being done correctly. My CERTIFIED webinar will help you understand how-to use visual content used on your website and through your social networks to increase brand awareness, generate leads and boosts your sales! Successfully integrate your image marketing into your overall marketing strategy. In 2016, 80.20% of all the Posts published were photos and videos. You can watch the recording of this webinar via the link below.